This old Tibetan silver amulet is thought to be at least 80 years old. Apparently when not being worn these remarkable assemblages were hung in the house for good luck and protection. In addition to the central shell, it has black amber, turquoise, amber, coral and shell, many stones carefully pegged in as well as set in bezels. The back is beautifully worked (see the detailed images). The bandolier is designed to be worn across the body with the amulet hanging at the waist on the left and with the old silver bird swinging free over the heart. (See it worn here.) 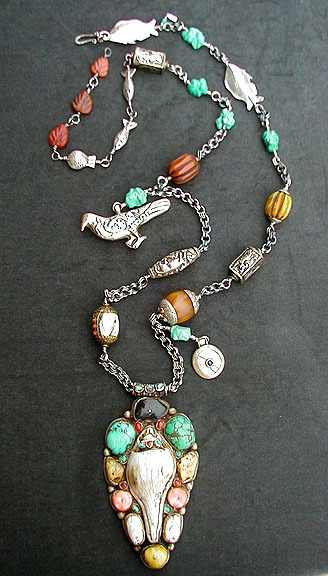 The long silver bead is said to be an old Sherpa bead, the rectangular ones are newer though they look ancient. Though one cannot be sure about amber actually being amber, these amber beads certainly feel like amber to my tooth. Big turquoise nuggets add color. A heavy chain of handmade soldered sterling triple links connects the elements. Flat fish and carnelians ride over the shoulder and across the shoulder blades for comfort. It is signed and dated. Please note this piece is very heavy because of the size of the amulet. I find it comfortable, but then I carry a kayak on my shoulder too. This piece looks stunning on a man or woman, it is extremely dramatic and an endless source of fascination.